The Bank of England expects growth this year to be the slowest since 2009 when the economy was in recession. It is forecasting growth of 1.2% this year, down from its previous forecast of 1.7% made in November. The Bank said it had seen further evidence that businesses were being cautious in the run-up to Brexit, including evidence from its own survey of firms. As expected the Bank kept interest rates on hold at 0.75%. The Bank put the fall in growth down to a decline in business investment and housebuilding, as well as a halving of the growth rate in exports. The UK was also being hit by slower-than-expected growth in the eurozone and China, the Bank said in its Quarterly Inflation Report. "Growth appears to have slowed at the end of 2018 and is expected to remain subdued in the near term," it said. The Bank even sees a one-in-four chance of the economy slipping into recession in the second half of this year. What did the Bank say about Brexit? There has been an "intensification" of Brexit uncertainties, the Bank said. It also noted a sharp fall in business investment at the end of last year. "Uncertainty appears to have risen recently, and may have weighed on investment by more than had been expected in August," the Bank said. 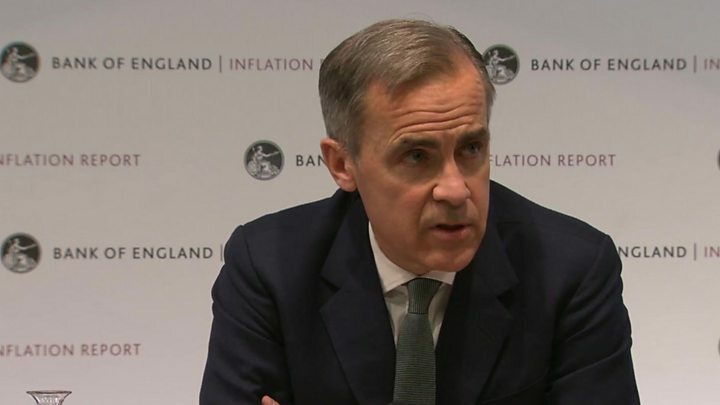 Bank of England Governor Mark Carney said: "The fog of Brexit is causing short term volatility in the economic data, and more fundamentally, it is creating a series of tensions in the economy, tensions for business." Interest rates remain at 0.75%, where they have been since the Bank of England last raised in interest rates in August. Many economists think that once the uncertainty over Brexit is lifted then the economy will accelerate and the Bank will have to raise interest rates to stop it overheating. However, recent economic data has indicated weakness in the UK economy. Growth in the service sector, the biggest part of the economy, appeared to have stalled in January, according to closely-watched survey of purchasing managers. Samuel Tombs, an economist at Pantheon Macroeconomics, predicts that the Bank will raise rates once this year and twice in 2020. Paul Dales, chief UK economist at Capital Economics, said: "We still think that a decent rebound in GDP growth, should a Brexit deal be reached, will result in interest rates rising further than the Bank and the financial markets assume." What effect is all this having on mortgage rates? Moves in interest rates are important to the 3.5 million people with variable or tracker mortgages. Even a small rise of 0.25% can add hundreds of pounds to their annual mortgage costs. "It's a very good time for people looking to borrow," said Andrew Montlake, a director at Coreco, a mortgage broker. He said there had been a lot of competition among lenders in January, with some very good deals for five-year fixed mortgage deals. Some lenders are offering five-year fixed deals at below 2%, he said. Concern over Brexit has held back some people from borrowing. "There is a lot of pent-up demand," said Mr Montlake. Savers who depend on higher interest rates to boost their incomes will be disappointed that rates have stayed on hold for a sixth consecutive month. Is the Brexit uncertainty hitting jobs? While the Bank cut its growth forecast it also noted the strength of the labour market, where the unemployment rate is currently 4%. The rate at which people are switching to new jobs is only slightly below the level hit before the financial crisis of 2007. That switching suggests that employers are having to compete to attract staff, the Bank said. It also noted a pick-up in the average number of hours worked at the end of last year and firmer wage growth. What does it all mean for our wages? The Bank thinks that wage growth will increase in the coming years as the UK's unemployment rate continues to fall. The main reason the Bank thinks underlying inflation pressures will grow is that wage growth will rise. Britain's unemployment rate has hit its lowest level in more than 40 years. The Bank predicts that earnings will rise by more than 3% a year over the next three years.